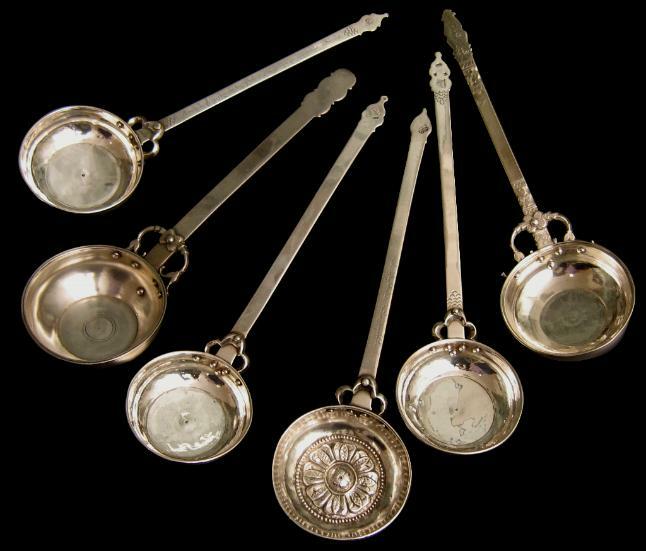 Each of these ladles is of traditional form with circular shallow bowls and long handles with cusped terminals attached to the bowls via elaborate appendages. The degree of decoration varies. Some are engraved; two have repoussed bowls, one in flower form. Two have Georgian inscriptions along the handles: One reads ‘I am the son of Demetre the Ploughman.’ The other reads, ‘The silver scoop belongs to Priest Grigol Natsvlshvili’. Some are with Georgian silver stamps. Ladles such as these were used at large Georgian feasts such as those associated with weddings to drink wine.